Preheat the oven to 160°C and lay the baguette slices onto a baking tray. Drizzle with half of the olive oil and place in the oven. Cook for 5 minutes, before turning the baguette slices and cooking for another 3 minutes. 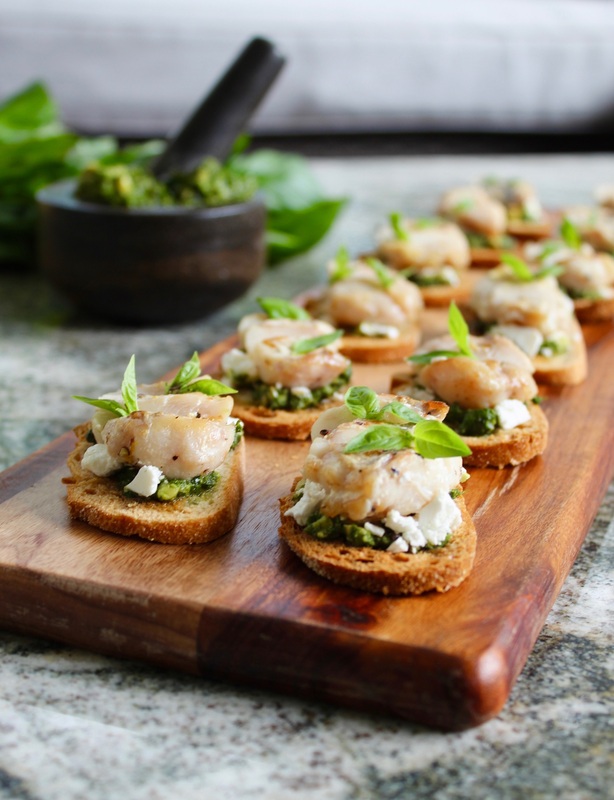 Place the baguette slices onto a serving board, and top with basil pesto and feta. Heat a frypan on high heat and add the remaining olive oil. Add the ocean jacket cheeks, skin side down, and sprinkle with salt, pepper and lemon zest. Cook for 2 minutes, before turning the fish and cooking for another minute. Slice each ocean jacket cheek into 3 slices, and place on top of the crostini to serve. Note: For homemade basil pesto add 1 bunch of basil leaves, 1 garlic clove, 1 tablespoon of grated parmesan, 3 tablespoons of olive oil and a pinch of salt to a food processor or mortar and pestle. Blend until combined.